Designed to complement the instruction of PPL(H) flying training in order to assist helicopter pilots in-training to achieve their "wings". Clear and simple diagrams aid verbal explanations to provide an easy to understand account of how helicopters are made, how they fly and how to fly them. 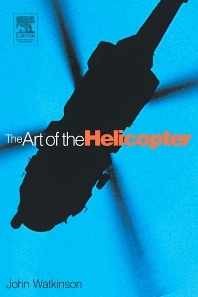 The only book to cover all the aspects of helicopter design, manufacture and performance in one volume. Students of Aeronautical Engineering; Trainee PPL(H) (Private Helicopter Pilot's License) students; Flying Schools and Flying Instructors; Qualified Helicopter pilots; Aviation enthusiasts. Chapter 1. Introduction to Rotorcraft Applications of the helicopter; A short technical helicopter history; Types of rotorcraft; Rotor configurations; The essential elements; The airframe; Engine and transmission; The fuel system; The landing gear; Oleos and ground resonance; The rotors; The control system; Electrical and hydraulic systems; Instruments and avionics. Chapter 2. Technical Background Introduction to mechanics; Force, mass and acceleration; Resultants and components of forces; Moments and couples; Work, energy, power and momentum; Efficiency; The mechanics of oscillation; The mechanics of rotation; Sidebands; Fourier analysis; Centrifugal and Coriolis forces; Rotating masses and precession; The gyroscope; Piezo-electric and laser gyroscopes. Chapter 3. Introduction to Helicopter Dynamics Creating and controlling lift; The centre of pressure; The coefficient of lift; Collective control; In the hover; Forces on the blades; Rotor coning; Torque and thrust in rotors; The rotor as an actuator; Blade element theory; Disc loading; Figure of merit; Blade twist and taper; Swirl; Vertical autorotation; Tip loss and the vortex ring; Ground effect; Cyclic control; Basic manoeuvres; In translational flight; Inflow and coning roll; Rotor H-force; Blade stall and compressibility; The speed limit; Harmonic generation; Vibration in rotors; Harmonic pitch control; Blade design. Chapter 4. Rotors in Practice The rotorhead; Control; Cyclic and collective mixing; Swashplates, spiders and servo tabs; The advance angle; Force feel and trim systems; Feathering; Why articulated rotors are used; Axes galore; The shaft axis; The tip path axis; The control axis; Flapping; Droopstops; Dragging; Order of hinges; Types of rotorhead; Zero-offset heads; Dangers of zero-offset heads - negative g; Rotor response; Tilting heads; Ground resonance; Air resonance; Dynamic rollover; Some rotorhead examples; Blade construction; Blade tracking; Blade folding. Chapter 5. The Tail Introduction; Balancing the torque; The conventional tail rotor; Tailrotor location; Tailrotor performance; The tailplane; The stabilator; Fins; The tailboom; The fenestron; NOTAR 5; Tail rotor failure. Chapter 6. Engines and transmissions Introduction; Choice of engine; A piston engine installation; A turbine installation; The gasoline engine; The ignition system; The starter; The oil system; The carburettor; Fuel injection; The turbocharger; Gasoline engine instruments; The aerodiesel; The uniflow diesel; Cooling systems; The fuel system; The turbine engine; Turbine fuel control; The turbine oil system; Turbine instruments; The electrical system; The transmission; Multi-engine transmissions; Transmission instruments; The helicopter rev. counter; Correlators and governors; FADEC; Tip jets. Chapter 7. Other types of rotorcraft The autogyro; The winged helicopter; The compound helicopter; The convertiplane; Multi-rotor helicopters; The side-by-side configuration; CO-axial helicopters; The synchropter; The tandem rotor; Remotely piloted and radio controlled helicopters; Radio control principles; Model helicopters. Chapter 8. Flight Instruments Types of flight instruments; The magnetic compass; Compass errors; The flux-gate compass; Pressure instruments; The altimeter; The VSI; The ASI; Gyroscopic instruments; The DI; The turn and slip indicator; The slip string; The artificial horizon; Modern displays: the glass cockpit; The radio; The intercom. Chapter 9. Control and stability Introduction; Attitude sensing; Airspeed and altitude sensing; Control signalling; Digital signalling; The computer; The processor; Interrupts; Programmable timers; Feedback; Hydraulic controls; Redundant and duplicated systems; Battle damage resistance; Stability augmentation; The Bell bar; The Hiller system; The Lockheed systems; Autopilots; Coupled systems. Chapter 10. Helicopter Performance Performance and safety; The Flight Manual; Limitations; Loading limits and CG position; Balance of forces in flight; Stability; International Standard Atmosphere; Pressure and Density Altitude; Effect of humidity; Effect of wind; Power required; Flying for maximum range; Flying for maximum duration; Flying for steepest climb; Autorotation; Stretching an autorotation. Reading, UK International consultant in audio, video and data recording.